Homecompass – yes, template – no. Mostly. compass – yes, template – no. Mostly. 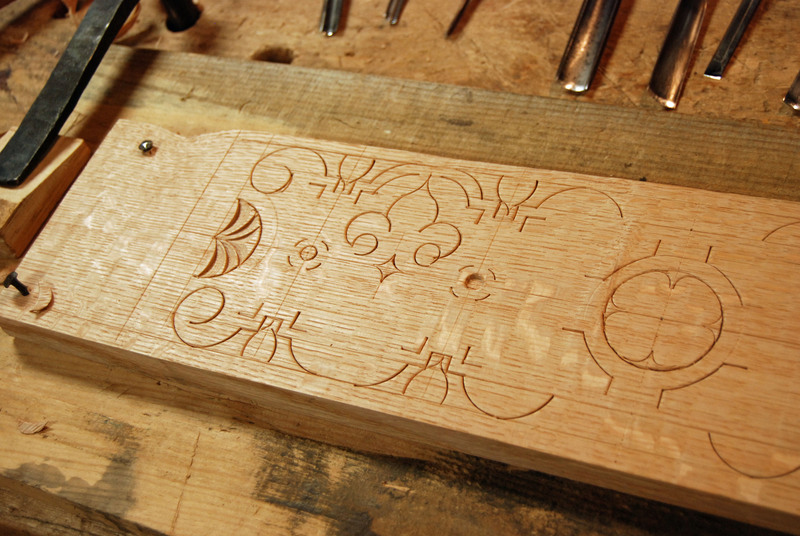 People often ask about the carved designs I use, specifically whether they are laid out with a template or pattern of some sort. The short answer is almost always no; principally because the work I am copying was not done that way, and one reason for that might be seen on this wainscot chair back. It is an excellent example of why a compass is easier than a template for this sort of work. The compass allows you to vary the scale of the design; if this carver used a template he’d need two different-sized templates to carve the panel and the rail below it…but by adjusting the opening of his “pair of compasses” he can then go on and carve it whatever size the stock or the project dictates. Alexander shot this photo years ago when the chair was in a private collection, it’s now at the Metropolitan Museum in New York. For the whole rundown on this chair and the fiveclosely related examples, see Frances Gruber Safford, American Furniture in the Metropolitan Museum of Art: 1: Early Colonial Period: the Seventeenth-Century and William and Mary Styles (the Metropolitan Museum of Art, New York, Yale University Press, New Haven and London, 2007) entry #18; and Benno M. Forman, American Seating Furniture 1630-1730, (New York: W.W. Norton & Co., 1988) ; curiously enough, also catalog #18. 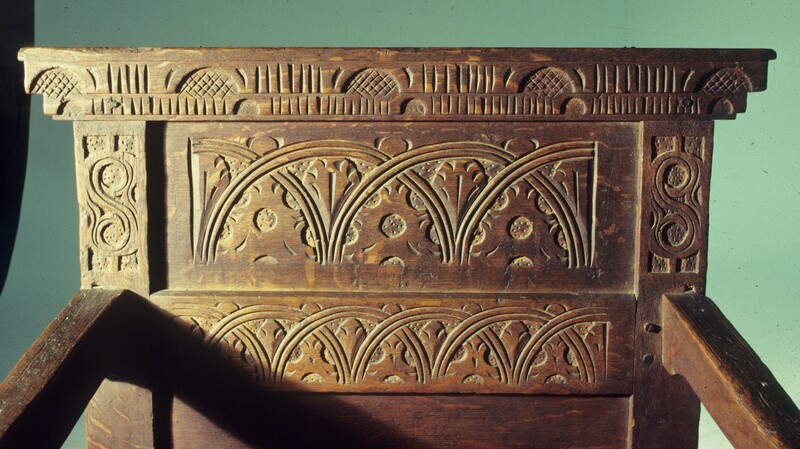 As to the use of templates, the group of so-called Hadley chests used a template to mark out the carved designs. Here is one a former apprentice in my shop, Brian Weldy, made about 9 years ago, along with a sample of the carved pattern. No telling what the original templates were made from, but this thin piece of oak works just fine. incised pattern, scribe lines, etc. and then came down with an awful cold…trying to do the annual shop clean-up now, then there’s lots of joinery to come. 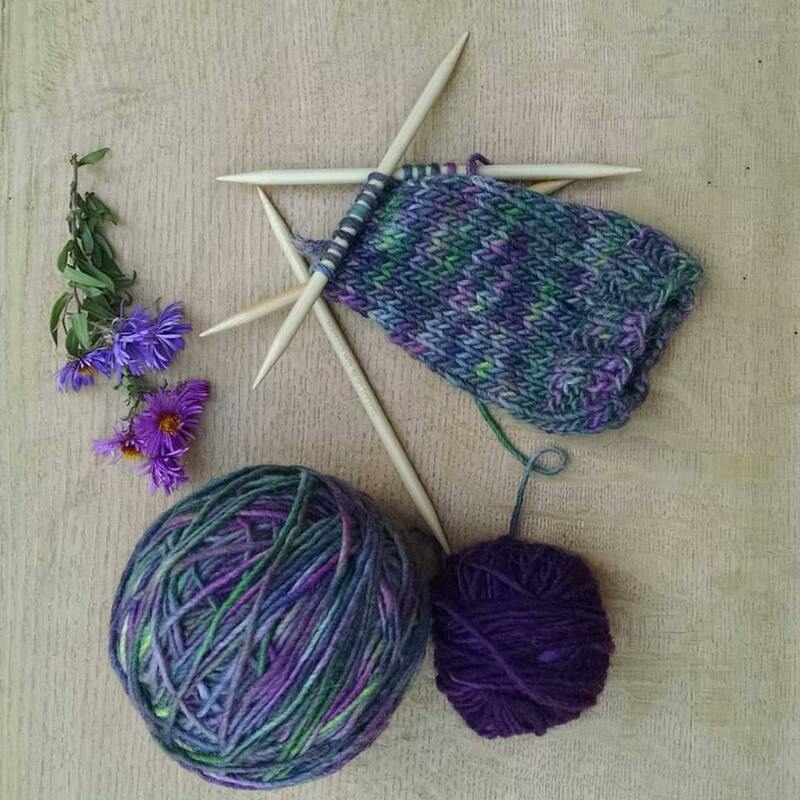 I’ll shoot the completed pattern when I get back to the shop. I love the pictures you post. And an extra thank you for linking the BIG versions so we can look at details up close. I purchased your carving video, and watched the whole thing. Very helpful for understanding the stuff you can’t get from a picture. 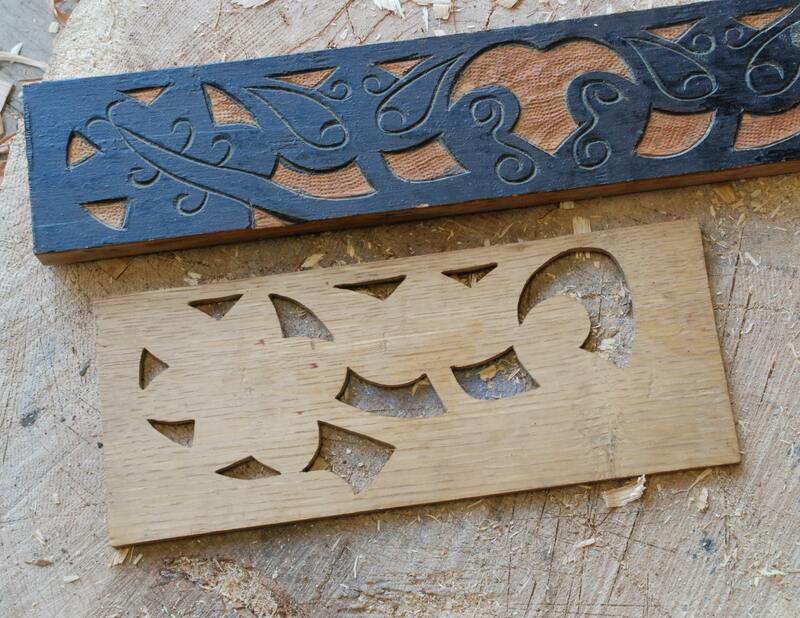 I’ve purchased a V tool and am asking Santa for some of the gouges, so I can try this out on some oak board. I’ve been staring at all kinds of pictures with a new eyes after that, trying to see how I can maybe reproduce it with the skills/tools you demonstrated. Now, to find the time. Sigh. The compass you use. Have you ever done a piece on it? I searched you blog but did not find anything. You use it in your recent released DVD which I purchase and enjoyed. Did you have it made by a blacksmith? I have looked high and low to find one simliar, but no success. Thank much. Really do enjoy your blog. OvniSpace.com est la référence dans le domaine des extraterrestres et des ovnis remplis de théorie la plus intéressante les unes que les autres ovnispace sera répondre a vos questions….